The impossible is happening. 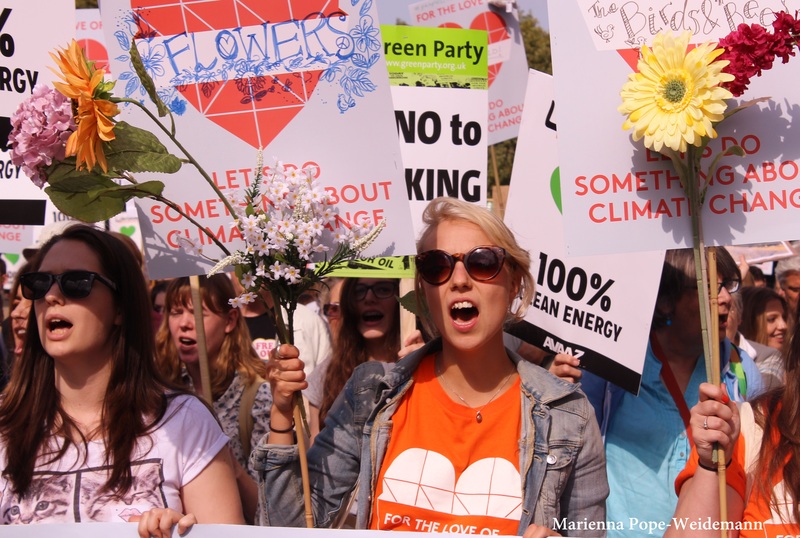 The People’s Climate March was a global day of action of historic proportions. 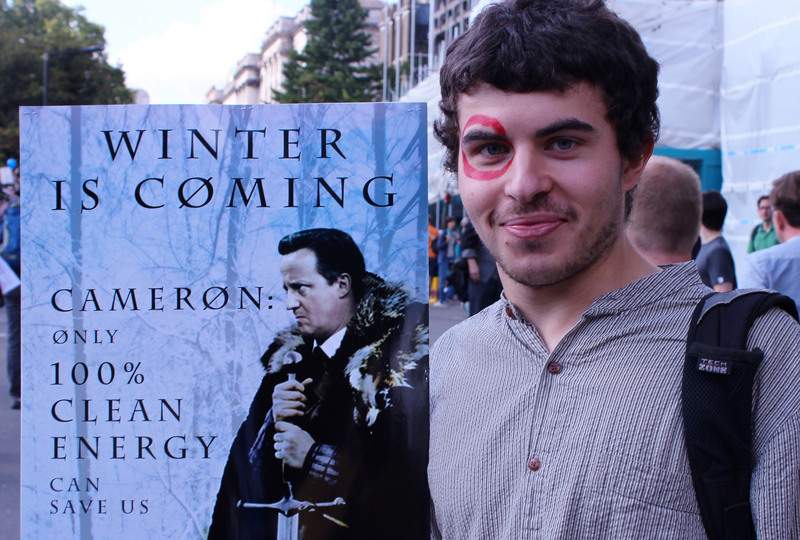 Over 30,000 people took to the streets in London. New York City hosted the biggest march climate march ever, with religious and labour leaders coming together with scientists, environmentalists and 400,000 Americans. 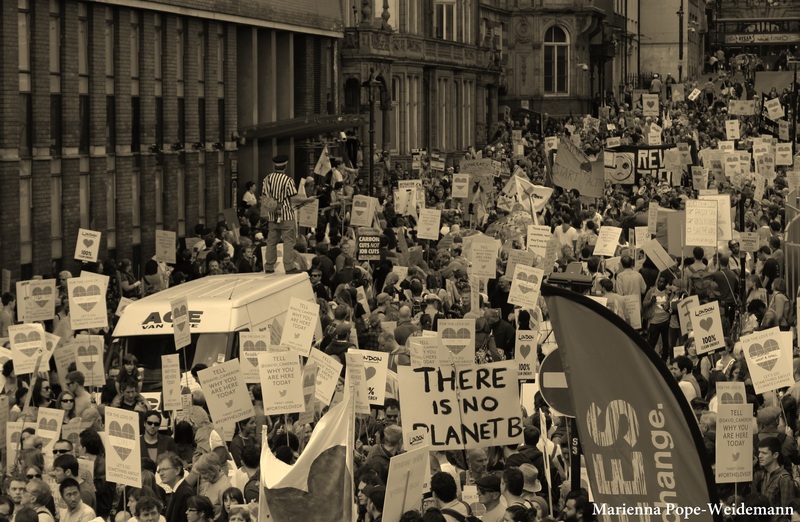 People protested in 166 countries demanding system change. Even the Rockerfellers are divesting (sort of). In Paris just over a year from now, the UN will be holding its Climate Change Conference, widely considered by experts to be our last chance to reach a radical and binding agreement on carbon emissions before planetary catastrophe becomes unavoidable. So if there was ever a movement who’s moment had come, it’s this one and it’s now. Yet much like the system it challenges, this is a movement filled with contradictions. Is it a movement against capitalism, or a movement within it? We live in a world where Coca-cola, a corporation which hires thugs to murder trade unionists in Latin America and systematically steals drinking water from India’s poor, can be considered a legitimate partner to ‘save the polar bears’ by WWF; where Unilever, one of the world’s most powerful corporations and leading food monopoly with an atrocious labour and environmental record, ends up sponsoring the People’s Climate March. Much depends on where we draw our lines. The American Dream of pointless over-production, which offers thirty kinds of smartphone all designed to break down but can’t allocate the resources to keep our local libraries and hospitals open – that dream has been globalised, and they call it ‘economic growth’. Co2 emissions, driven by deforestation (at a rate of around 36 football fields per minute) and the burning of fossil fuels, have reached historic and deadly levels. By even the conservative estimates of the IPCC, this will flood major cities, destroy whole societies, create a global refugee and food production crisis – it will change the world forever, unless we start reducing emissions within the next year and leave 80% of known (and owned) fossil fuel reserves in the ground. But despite all the campaigns and the summits, to recover from the financial crash within the confines of capitalism, global emissions were allowed to shoot up in 2010 at a faster rate than at any time since the Industrial Revolution. It’s been the same with carbon trading, a climate-saving measure reduced to a money-making slot machine. Total emissions keep rising while hospitals and universities are obliged to buy extra credit, big business is making money trading and gambling on the carbon market while energy companies pass the costs onto consumers. The price on emissions, by IPCC estimates, is five times too small to discourage the Big Polluters. But perhaps worst of all, current rates are big enough to create an apparent conflict of interest between the climate and the majority of working people who struggle to pay their energy bills. But whether it is more ‘pragmatic’ to tackle capitalism explicitly or to ignore it, is a question of whether it’s possible for climate constraints to be respected following strategies determined by commercial potential. The answer, in short, is a resounding ‘no’. That is simply not possible in an economy dominated by corporate interests whose nature is to exploit catastrophe rather than prevent it. The UNDP estimates that genuinely ecological economic development of the South would require an $86 billion per year wealth transfer from North bypass reliance on fossil fuels – and capital flows are still moving in the opposite direction. That corporate monopolies of intellectual property rights have been allowed to obstruct this transition and save millions of lives is a supreme indictment of the free-market system. The Big Six agribusiness multinationals are already patenting ‘climate change crops’ at a rate of knots. We saw when the poor were left to fend for themselves during Hurricane Katrina, how ill-equipped the market system is to protect even ‘the Western poor’. In fact New Orleans’ budget for sea wall maintenance was cut from 2003 to finance the War on Terror, during which they were receiving a sixth of the funds they requested. Separating the hurricane from its political context is impossible, and there is a lesson in that. The 2009 Copenhagen Summit was a final straw for many. The world watched as the emphasis slid from stopping global warming to funding ‘adaptation’ – grants and loans extended mostly by the countries responsible for past and present global warming, to those most endangered by it. Funding is determined not by need, of course, but by their openness to ‘clean’ investments from Northern multinationals. Even though world’s oldest industrial powers are overwhelmingly responsible for historical and current climate change, Western leaders have the gall to offer IMF loans parcelled in exploitative conditionality agreements to help poorer countries pursue ‘sustainable development’. The delegate from Tuvalu famously equated the funds with Judas’ thirty pieces of silver. More than that, it’s the mass crime against humanity that will define our times and it will cost millions of lives. It’s time to make a change. Thanks go to the following authors, who’ve done excellent work on this subject on which this series of articles draws heavily: Naomi Klein, Daniel Tanuro, George Monbiot, Vandana Shiva & John Bellamy-Foster. 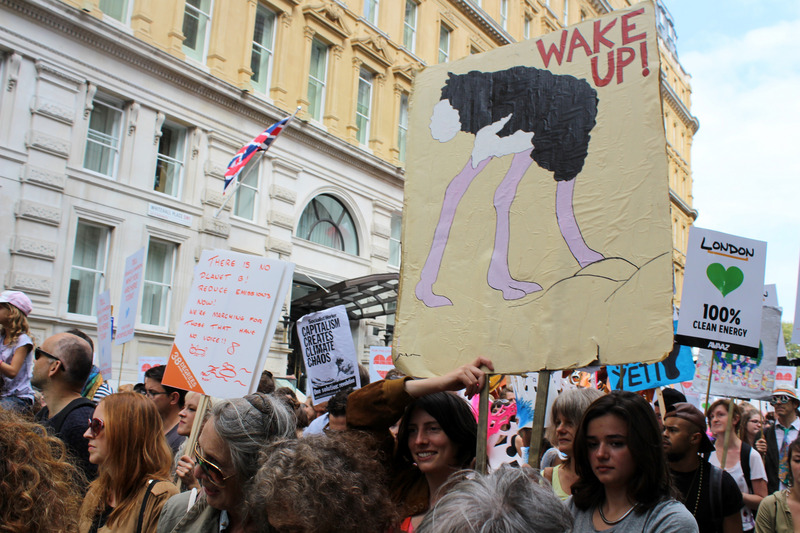 This entry was posted in Articles, Environment and tagged capitalism, carbon emissions, climate, Climate Change, ecology, global warming, green growth, peoples climate march by Marienna Pope-Weidemann. Bookmark the permalink.